Mechler said he had nothing to do with the decision to allow the group, the Metroplex Republicans, to have a booth at the state GOP convention. “I understand that hatred has spewed into the chairman’s race,” Mechler said. Quelle surprise. You can’t spell “zealous hatred of the gays” without the letters H-O-T-Z-E, and indeed this mail was sent by Houston’s gay-hatingest quack. Nothing surprising there, though you may find yourself wondering how in the heck Jared Woodfill could be in a position to fail upward like that. Well, Woodfill as State GOP Chair is indeed a thing that could happen. Houston’s Jared Woodfill is trying to win control of the Republican Party of Texas, challenging the current management and saying it has been too quiet in the face of legislative defeats in a state government dominated by Republican officeholders and appointees. 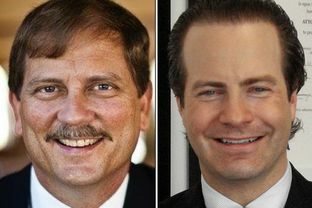 The contest between Tom Mechler of Amarillo, the party’s current chairman, and Woodfill, who once led the Harris County GOP, is a fight about purity, about which kinds of conservatives the Texas GOP represents and about what the party is supposed to be doing. They don’t run as combined tickets, but former state party Chairman Cathie Adams is running for vice chair in tandem with Woodfill, while current vice chair Amy Clark is seeking reelection, along with Mechler. The outcome of the elections, to be held at the GOP’s state convention in Dallas next month, probably isn’t going to change your life, but it’s interesting. Mechler wants the party to bring in more voters — he’s talking about minorities and millennials, among others — who have generally eluded the charms of the GOP. He doesn’t think it’s his job to tell the state’s Republican officeholders what to do. Woodfill is a bully-pulpit guy, a political figure whose effectiveness depends on everything from actual microphones on actual podiums to social media, news media and advertising. He is appealing for the support of others who, like him, think the state political party should be whipping the Legislature to keep it in line with the GOP platform and the beliefs of Texans in its voting base. Woodfill focuses on a list of issues that met their demise, he contends, in the Texas House, including bills outlawing references to Sharia law in courts, requiring Texas cities to enforce federal immigration laws, allowing the use or diversion of tax dollars for private school tuition, repealing in-state tuition for the children of undocumented immigrantsnon-citizens who graduate from Texas high schools, and enacting new ethics legislation. That plays into existing divisions among the Republicans in government, however they are characterized: establishment against insurgents, social conservatives against social moderates, chamber of commerce against grassroots. The characterization that matters here is that Jared Woodfill is an idiot, and would almost certainly be a terrible state party chair. He’s certainly not going to be about building a party for the future, or one that intends to grow. All of which, needless to say, is fine by me. I’ve said that scandal, in the form of criminality from the likes of Ken Paxton and Sid Miller, may help boost Democratic prospects in Texas in the short term. Incompetent leadership, especially when combined with an unwelcoming attitude towards anyone who isn’t already fully on board with a full slate of ideological shibboleths, would also help. And Lord knows, we Democrats can use all the help we can get. So please do your part, RPT. Please put Jared Woodfill in charge of your party. Thanks. The gay Republicans have money, they want to rent a booth…..let them Folks need to ask themselves why they feel compelled to suppress free speech. This is no different than the militant female college professor who called for “muscle” to eject the reporter. Does Hotze think the “gay” will rub off on the other Pubs? It was not even close. Woodfill only won 4 of the 31 state senate districts, and one of those was at first a tie vote.